Monitor fluid intake (IV fluids) and output (urinary catheter) and measure hourly. Note amount of urine obtained when catheter is inserted (indicates pre-burn renal function and fluid status). Assess body temperature, body weight, history of pre-burn weight, allergies, tetanus immunization, past medical surgical problems, current illnesses, and use of medications. Continue to assess the extent of the burn; assess depth of wound, and identify areas of full and partial thickness injury. Provide humidified oxygen, and monitor arterial blood gases (ABGs), pulse oximetry, and carboxyhemoglobin levels. Maintain proper positioning to promote removal of secretions and patent airway and to promote optimal chest expansion; use artificial airway as needed. Note and report signs of hypovolemia or fluid overload. Maintain IV lines and regular fluids at appropriate rates, as prescribed. Document intake, output, and daily weight. 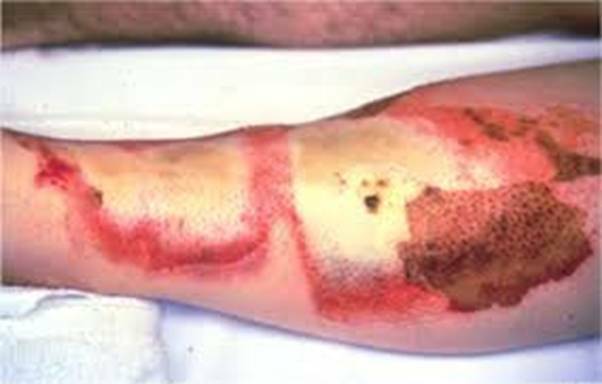 This entry was posted in Nursing Interventions and tagged Burns, Emergent/Resuscitative Phase, nursing interventions. Bookmark the permalink.